Four Short Stories for the price of three!!! Bad luck follows Celia Thompson into Texas where she goes with her new husband to start a new life. A tragic misfortune leaves her stranded and alone in the middle of the rugged West Texas wilderness. When Nate Walker sees buzzards circling in the distance, he rides out to investigate. He discovers a young widow, who is ill and in dire straights. He takes her to his ranch to rest and recuperate. In time, Celia recovers her health, but can her heart heal enough to accept and return Nate's love? Two sweethearts torn apart . . .
One day after school, Josh Stone and Emma Carter pledge their love to one another beneath the old kissing tree. Then Josh's life takes a drastic turn when his father dies. 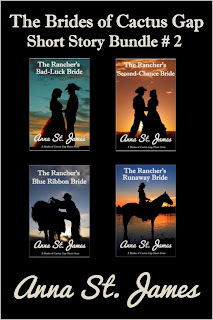 He must work night and day to save his ranch and has no time for courtship. Emma's father sends her to Atlanta to live with her grandmother so she can forget about Josh. But she can't. True love reunited . . .
After five long years, Emma finally returns to Cactus Gap. When she meets Josh again, their time apart fades away, and their love still burns strong. Can they take up where they left off? Will they be able to overcome the obstacles of pride and prejudice to find their happy-ever-after? You know what they say: The way to a man's heart is through his stomach . . .
Maddie Carmichael is darn near the best cook in Cactus Gap, and she has the blue ribbons to prove it. She loves Chet Grayson, but can't marry him because of a promise she made to her dying mother. Maddie's loyalty to her family only makes Chet love her more. He vows to find a way so they can be married. 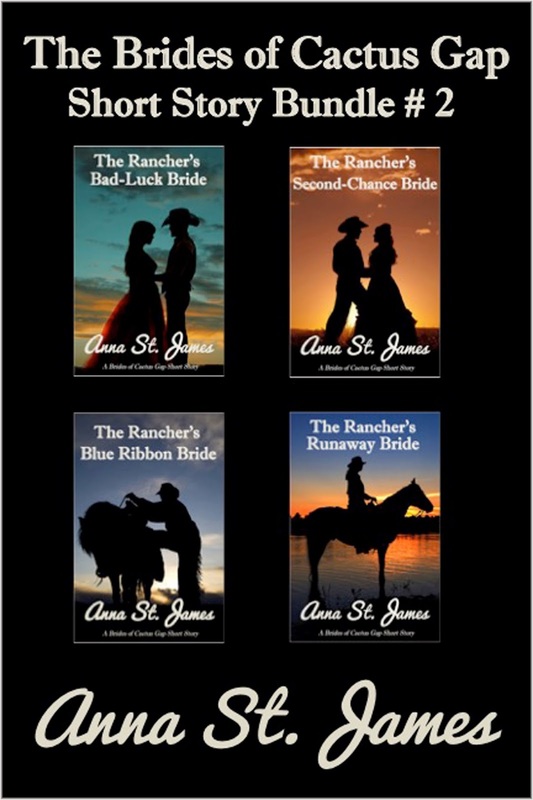 Will he succeed and win his blue ribbon bride? When her pa promises her hand to a man older than himself, Cora Hodges has no choice but to run away. With no kith or kin to turn to, she flees the only home she’s ever known and seeks help from her good friend, Gabe Sanders. If anyone can help her out of her predicament, that rugged rancher will be more than able. But will the handsome rancher be willing? Gabe's friendly feelings for Cora have undergone a drastic change since she’s grown into a beautiful young woman. When Cora comes to him in dire need of rescue, what’s a fella to do but offer matrimony and the protection of his name? But how will Gabe endure a marriage in name only, loving Cora the way he does? Rachel Hendricks moves to Cactus Gap, Texas, to reclaim her young brothers whom she sent out West on the Orphan Train after their parents died. She plans to reunite her family and make a home for them so they can start a new life together. Reese Cooper takes the Hendricks boys under his temporary guardianship and provides room and board in exchange for good honest work. Even though he still mourns the death of his wife, the two boys inch their way into his battered heart. When their sister comes to claim them, Reese discovers the healing power of love. Emily Parker is an outlaw on the run. Dressed as a boy and wounded by a bullet, she seeks shelter from the cold winter's night in Jake Stewart's old barn. Barricading herself in a stall behind a bale of hay, she's ready to shoot anyone who dares enter her temporary sanctuary. When Jake discovers an injured fugitive hiding in his barn, his only thought is to save the young man's life. When he discovers his patient is a lady in disguise, he realizes he's stumbled upon trouble with a capital T. As he nurses Emily back to health, Jake learns the true meaning of love and vows to help her anyway he can . . . even if it means marriage. While tracking and hunting game, Cal Jackson discovers a young Comanche woman hiding in his pasture. From the very first moment he sees her, a strong bond is forged between them. Cal has almost given up on finding someone he can love. Has fate brought him this Indian maiden to call his very own? After her tribe is brutally massacred, Yanny runs for her life. Injured, weak and hungry, she welcomes a handsome stranger's offer of help. Accepted into the midst of the loving Jackson family, she slowly heals and recovers from the bloodbath she miraculously survived. But can she survive in the white man's world? Can she win the love of the man who saved her? 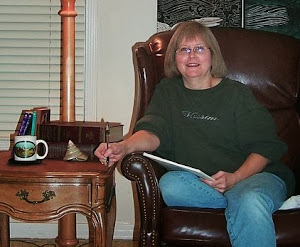 When Sarah Monroe's abusive husband dies, all she feels is blessed relief. When she inherits her uncle's house in Cactus Gap, she moves to Texas for a chance to start fresh. Happy in her new-found freedom, she swears off men and marriage forever. Until she meets Zach Whitfield. Zach is on a mission to find a bride. From the moment he sees Sarah, he's completely smitten. When tragedy strikes, leaving him guardian of his best friend's young daughter, Zach asks Sarah for help. Can he break down the fortress surrounding her fragile heart? Can he persuade her to become his wife? 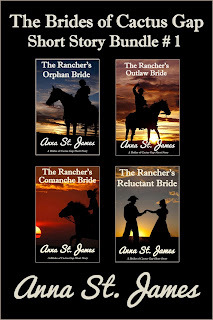 If you like Historical Western Romance sprinkled with a light touch of Inspiration, then you've come to the right place. My short stories are sweet romances filled with love and happily-ever-afters. Enjoy!! !